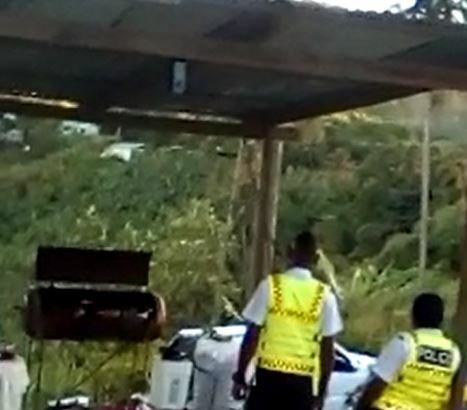 Saint Lucia police are investigating a viral video on social media in which a ‘known criminal’ with a firearm issues a threat while standing a short distance behind two police officers in uniform, reliable sources have said. While the two officers, one of them a female, were oblivious to what was taking place behind them, the man pulls a firearm and chambers a round. The video, in which the man’s face is not shown, then comes to an abrupt end. “The police are actively investigating this matter,” a very senior law enforcement official told St Lucia Times Sunday. The official however, refused to be drawn into commenting further. Sources have told St Lucia Times that the man who in the video who had the firearm in his possession was identified by his voice. The Police Welfare Association (PWA) is ‘extremely concerned’ about the matter and has summoned an emergency meeting of its executive for Monday to discuss the issue, the sources have said. The video is believed to have been recorded at Vanard on Saturday evening about 7.00 pm, according to information obtained by St Lucia Times. No one seem to care about people’s safety in this country, there is always a plan during election champagne, after wards you will hear the Opposition barking like mad dogs, and those elected are going their merry way, treating us with mépris and been arrogant in dressing people. . This is our situation right now. Criminals now have the courage to provoke the police and the law! Well i am an elderly, and i have done all i could to be a law abiding citizen, i can now die! because no one seem to care about our safety. THAT IS HOW I SEE IT; merrily, merrily, merrily life is but a dream. That’s what happens when our borders are so porous and left to money hungry custom officers. No gun is manufactured legally, so they come in illegally through our borders. We cannot continue to depend on custom officers to protect our borders. Border COntrol needs to be revamped. All law abiding Lucians should take to the streets and protest against the norm. This has to changed and more or better control at our borders. I suspect dem guns coming form Colombia, Martinique and Venezuela. Put visas on all those 3 countries. I don’t want to be rude but “no gun in manufactured legally” so all the gun manufactures in the US, UK, France. Israel, Germany …… are all producing guns illegally! How can implementing VISAs prevent guns from being smuggled into Lucia? In fact don’t answered because judging by your above comment it won’t be sensible. Think of this for one minute (you may need longer) the US has VISAs restrictions on almost all the South American countries you mentioned and more. Why is it cocaine still ends up in the US with all the VISA restrictions! Engage your brain I don’t swallow what people in supposed authority feed you especially if they’re Caucasian! Mary Francis running her mouth. It’s 2011 all over again but the moment the police start cracking down on crime, Mary Francis starts shooting her mouth off.